Working from home certainly has its perks. But the grass is not always greener. Adjusting from working full time in a shared office space, to working full time from home takes a little getting used to. Here is a glimpse into a day at the home-office, with tips to make working from home work for you! Tip #1. The alarm goes off. I hit snooze knowing that my daily commute from the second-floor bedroom to my home office is a mere one minute, tops. When working from home, it’s easy to just roll out of bed and open the laptop. Although you’ve shaved minutes, maybe even hours off your office commute, you should still give yourself time to prepare for the day ahead. Stick to a routine in the morning, just as you would as if you were heading into an office. Get up at the same time every day and actually get dressed! This is one of my biggest tips. You don’t have to wake up and put on your nicest business suit, but changing out of your pajamas will do wonders for your mood and energy level. Making the conscious decision to switch gears out of sleep mode can help you feel more prepared to tackle the day. Tip #2. It’s time to head to work. Another key to a successful work from home set-up is having a clearly defined “office” or workspace. This can vary, depending on how many extra rooms you have in your house, but try to keep a place designated for work and work only where you can sit down and feel like you’ve started your day at the office. An added bonus, is a room with a door for shutting out those “at-home” distractions, like kids, pets and other family members. A perk of the home office is being able to avoid interruptions by a chatty cubicle neighbor, noisy phone calls, and general office banter. In my situation, working from home is peaceful and quiet. After my husband leaves for work and my dog snuggles up under my feet for the day, the only occasional distraction is the UPS man. Tip #3. It’s lunch time. I head into the kitchen to reheat leftovers or prepare a quick and healthy lunch from scratch. Here’s another perk of working from home – a fully functioning kitchen as your lunch room. It’s healthier and more cost effective to eat lunch at home. Plus, you never have to worry about someone stealing your lunch from the office lunchroom. One downside, food and snacks are constantly at your disposal and can make for easy mindless snacking. Just keep your house stocked with healthy options and that won’t be an issue. Tip #4. The day is coming to a close and I’ve had a productive 8 hours of working from home. Here comes another challenge. Because you don’t have to leave the office to get home, ending your workday can sometimes become blurry. It’s really easy to just keep working even when the day is done and all of your coworkers have gone home and ended their days. When you never leave home, the line between work and home often becomes difficult to distinguish. This brings up another work from home dilemma. NEVER leaving your house. After my first few months of working from home, I began to feel very hermit-like. One thing I’ve done to combat this, is scheduling gym classes for the end of my days. Being forced to shut down for a bit and get out of the house is a good way to clear your mind and get some fresh air. In the warmer months, I also try to fit in a quick walk around the block with my dog, or get outside to water my flowers and chat with a neighbor mid-day. It’s amazing what 5 minutes of fresh air can do for your mind and energy level! Working from home definitely has its perks, but requires focus and self-motivation. 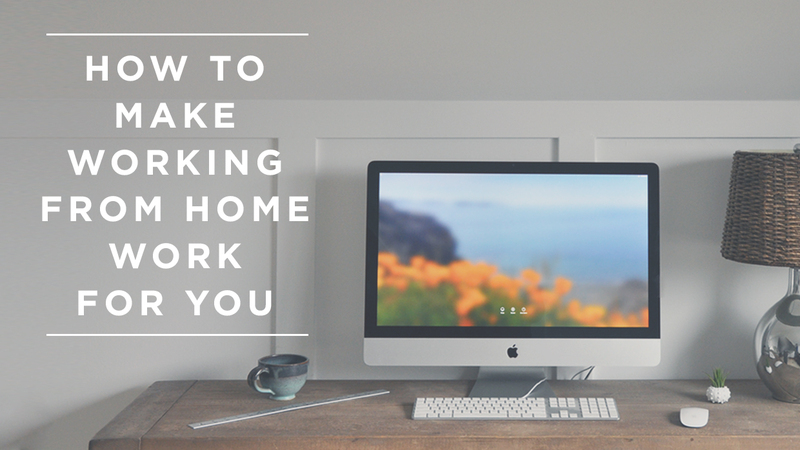 Hopefully these tips can help if you find yourself working from your own home office. Need help with a project? Send us an email or give us a call at 910.681.0548. We promise no one will answer the phone in their pajamas.